Posted by Mollie Hamelund on January 23, 2019 in Football, Sports, Top Stories. Ferris senior offensive tackle Devon Johnson recently made the trip to California to compete in the National Football League Players Association (NFLPA) Collegiate Bowl. The bowl game, which has been around since 2012, was made for college athletes that do not have the opportunity to play in a bowl game that Division I teams do. Many players from Division II are represented in this bowl game, and all 32 NFL teams have their coaches there to watch and scout these athletes. 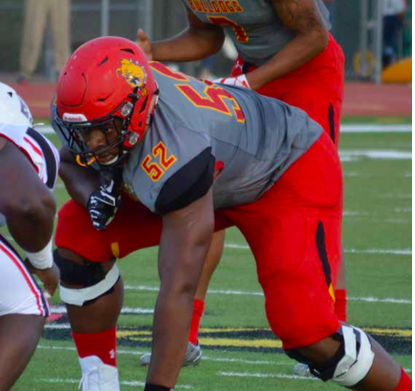 Johnson, who was with the Bulldogs for five years, credits his success to Ferris football head coach Tony Annese. The NFLPA game was hosted Saturday, Jan. 19 in Pasadena, Calif., where the historic Rose Bowl is held every year. Johnson traveled there about two weeks before the game and began practicing with his new team. “Mentally, I’ve practiced all week and been having a lot of fun with new things and learning about a lot of new stuff,” Johnson said. In the 2019 game, Johnson was competing on the National team. The American team ended up winning the close game with a final score of 10-7, but although his team didn’t win, Johnson still said it was worth the experience. Being one of the starting players for most of his time with the Bulldogs had also prepared him for the game.